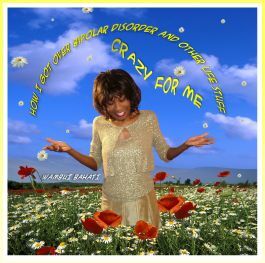 Crazy for Me is an inspirational, entertaining, personal narrative, self-help CD for people who are living with or recovering from (so-called) mental illness, and from bipolar disorder in particular -- and, Other Life Stuff. Through trial and era, while recovering from her own (so called) mental illness, she became an expert on the challenges and - most importantly - the possibilities facing the more than 20.9 million American adults who have been diagnosed with mood disorders. "I couldn't stop listening to your CD . . . "
"I celebrate u...u r wonderful.I couldn't stop listening to your CD....from one crazy lady to another u nailed it. I encourage you to continue to be a "spokesperson" for mental health with this CD and show...your voice and energy is amazing on this topic." President, JWH Training & Consulting Inc. I was searching for something that would motivate me to improve my bipolar disorder and WOW your message hit the nail on the head . . .